I have a list of things to do: put up some shelves, put up some hooks, paint the upstairs landing, insulate the floorboards, put tyres on Imp’s bike, put up some candle-holders, box out a recess, chop wood, put up curtain rails. I like doing jobs… especially those that involve power tools. I also like using power tools and impressing Imp with my power-tool-abilities. Today is going to be a triumph of powertoolness. I decide to start upstairs and work down. The most upstairs of the jobs is to put up some coat hooks. This will be a nice easy job because the bloke who lived here before had already put them up… but he didn’t put Rawl Plugs in so they fell out. Easy-peasy. Re-drill the holes, pop some plugs in, screw the hooks to the wall. 30-second job. Whistling cockily and jauntily assuming that 'don’t-mess-with-me' drill stance I whizz the trigger and grin. The drill hits something hard. Harder than wall. I remember I haven’t got a cable detector and worry that I might drill into an electric cable. I like drilling but I don’t like dying. Or at least, not as far as I know. I check the other side of the wall. There’s a shower there. I don’t want to drill into the shower. There are 2 of them.. the third is already up. 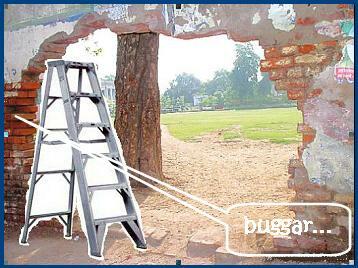 I balance on the step ladder and blast away at the wall with the hammer-drill. It’s easy for about 4mm and then I hit something hard. There is ABSOLUTELY no way I’m giving up on this job. I push a bit harder. The drill is starting to smell alarmingly hot. Suddenly it lurches forward through whatever it is that is hard and, driven by my bodyweight the drill bit and the bit-holder punch a hole into the wall. A hole the size of a 10 pence piece. It’s going to take quite a few matchsticks to pack that hole. Checking quickly that no one has seen, I give up and head toward the kitchen in search of coffee. I don't like power tools: things of beauty they may be, but holding one that's plugged and ready to go induces a pounding heart and a cold sweat. I onec tried to drill a hole into the wall in this very room. The hole needed to be positioned in the wall next the main outlet pipe from the gas meter up to the central heating boiler. As I drilled away (heart pounding, sweating), the plaster gave way, the drill lurched forward (snapping the bit) and scraped along the gas pipe. COuld've been interesting. It turned out that the slack bastards who put the gas inlet pipe in from the mains just filled the hole around it with screwed up newspaper then plastered over it. Hence: medium-resistance plaster; zero-resistance Daily Mirror ca 1976; very high-resistance brick. I don't like power tools either- I'm far more of a Wait Til Someone Else Does It useless sort of girl, rather than a DIY one. Plus, the one time I tried to use a drill I caught my sleeve in it and managed to get pinned to the wall..
Heh heh! more drill stories, please - these are hilarious. :-) This is a hilarious post!! I like power tools too but I'd say my fave is not the drill but the sander. uh, sorry to hear about your wall by the way. I'm useless with powertools. 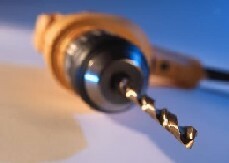 I turn one one and the drill bit stays absolutely still while I spin like a Catherine Wheel. Imp gave me a sander for Christmas. If she would let me take it to bed with me, I would. I'm banned from using power tools on account of my tendencies to don a hockey mask and threaten small children with them. Do you wear a utility belt when power tooling? No, I'm much too hard for that. I like to make things as difficult as possible.. Trying to drill hole through for aerial. DIY? Tears I tell you. Next time try drilling through the wood. Little tip. One of my happiest memories was of my father drilling through an electric cable. Afraid I have no power tool anecdotes to share having never used one. Diolch yn fawr i ti, hefyd! Nice to hear from you, tfad. It's a great site though, I'll be sure to tell all the sad gits who visit this site about it. They need stuff to do while they're pretending to work, you see.